Here we will discuss some methods for manufacturing waveguide parts, and show you a useful rule-of-thumb to avoid lossy waveguide parts. 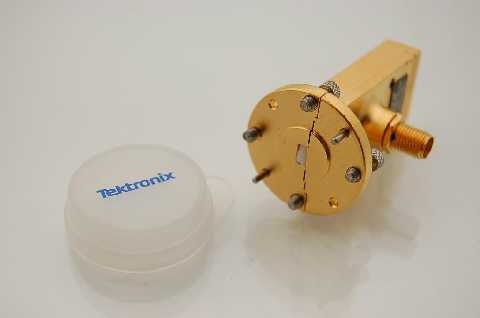 We now have an example showing the construction of a short-slot coupler for 94 GHz! Typically waveguide is made of brass, copper, silver, aluminum, or any metal that has low bulk resistivity. It is possible to use metals with poor conductivity characteristics, if the interior walls are properly plated. It is even possible to make plastic waveguide! See our section on skin depth to learn more about RF losses in conductors! 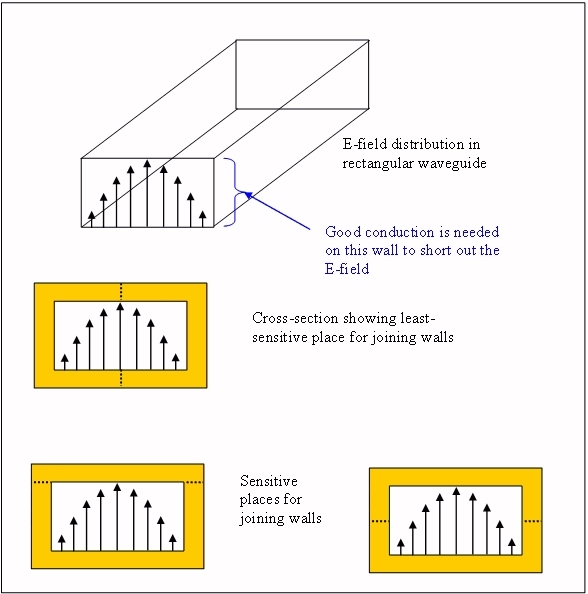 There are many ways to form waveguide structures. The simplest procedure is to start with stock waveguide and flanges, do some bending, then weld, braze or solder on the flanges. This is not practical for more complicated structures such as combiners, couplers and filters. With the increasing need in industry to go further into the millimeter microwave spectrum, the fabrication of complex waveguide structures presents a challenging problem. There are several manufacturing options for consideration. Some of the text below is thanks to Ryan, a microwave engineer with the advantage of a dual background in EE and ME disciplines! One versatile (but expensive) way to build complex waveguide structures is electro-forming. This means forming the entire structure by building it up on a form of some kind using electroplating. Then you burn out the piece you started with to leave the waveguide. This works well for complex structures, but is not applicable to waveguide assemblies where appreciable structural stress will be applied. This can get expensive because it takes a lot of time to create a solid part one molecule at a time, and as we all know, time is money. Another option is dip-brazing. Dip-brazing is also a specialized process for joining aluminum pieces, but is cheaper than electro-forming. Pieces of the waveguide must first be machined from a solid block of material, commonly aluminum 6061-T6 or an equivalent aluminum alloy. A thin doping layer is applied to the aluminum pieces on surfaces to be joined; this drops the melting temperature of the metal only where it contacts. The finished waveguide is then placed into a bath of molten salt and then brought up to the metal's near-melting point. A lot of trial and error and experience is required to pull off the exact temperature profile that will braze the joints but not melt the waveguide pieces into an unrecognizable blob. After the waveguide is removed from the bath it must be hardened. During the brazing and hardening process the walls of the waveguide can become deformed from their ideal geometry. At frequencies Ku-band and lower this tends to not be much of a problem; a few mils of error represent less than 1% error and do not cause an appreciable effect on the insertion and phase of the signal at these frequencies. However, when reaching higher frequencies such a Ka, V, and definitely W, this becomes a problem worth thinking about when considering dip-brazing. There are two types of electronic discharge machining: wire EDM and plunge EDM. Both methods use high-voltage to melt away metal, rather than mechanically removing metal with cutting tools. Wire EDM uses a very thin wire that travels from one spool to another, is energized with high voltage, and is placed in contact with the part being machined to make a linear cut by blasting away material. Picture a tiny, round bandsaw... The part being machined is typically held stationary, while the two spool feeds are moved to steer the saw. In the best wire EDM machines, the top and bottom spools can be moved independently. This allows more complex shapes, for example, a cone can easily be machined. The part being machined is suspended in an oil solution, which is used to carry away and suspend the machining "dust". The accuracy of modern wire EDM machines is one mil or even better. Wire diameter for wire EDM is typically just a few mils, and brass is the material of choice. 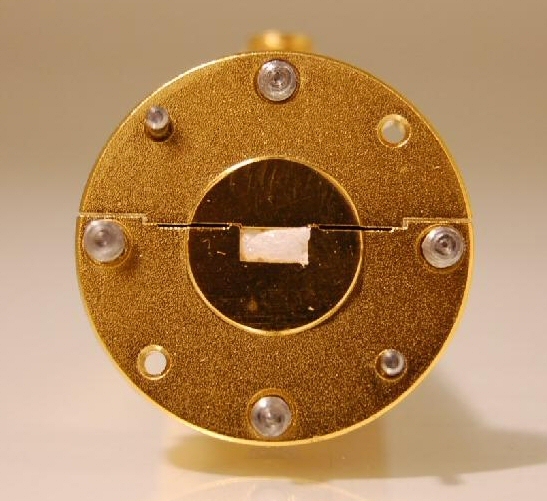 A five-mil brass wire will allow you to cut a 2.5 mil inside radius on your waveguide part. Plunge EDM uses carbon elements that are energized to high voltage, and are pushed into the part being machined to blast away unwanted material. The part being machined is suspended in an oil solution. The plunger can be a complex shape, and can be moved in X, Y, and Z axis, as well as rotated, enabling more complex shapes than wire EDM. Accuracy is better than one mil. Plunge EDM is far more expensive than wire EDM, because the plunger must be machined, and it has a short life. Plunge EDM is best used in tool and die manufacturing, or creating extremely accurate molds for injection-molding plastic parts. The expensive but highly accurate plunge-EDM part that is then used to create thousands more parts. ANC is a versatile method of cutting complex shapes using rotary cutting tools. Modern ANC equipment allows operators to set up a job and walk away, while a computer feeds the part under the tool head, and even changes tools to optimize machining times. Inside radiuses of about five mils are achievable. Waveguide parts are machined in pieces, which must be joined together using techniques such as dip brazing. Stereolith used to be just a way to create mock-up parts that you could paint, show a customer, then watch them slowly disintegrate. Not any more! Stable compounds have been developed that can provide 1-mil tolerances, are strong, and provide a "substrate" for depositing metal such as electroless copper. The figure below illustrates one of our rules of thumb. The joints in a two-piece waveguide are best done along the broad wall. This means cutting across the H-plane, with the cut in the E-plane. See our description of E and H planes here. Below is an example of what not to do when you make waveguide adapters (maybe we will put this example in the Microwave Mortuary too)! A certain nameless microwave vendor shipped some waveguide adapters to an unsuspecting microwave engineer. 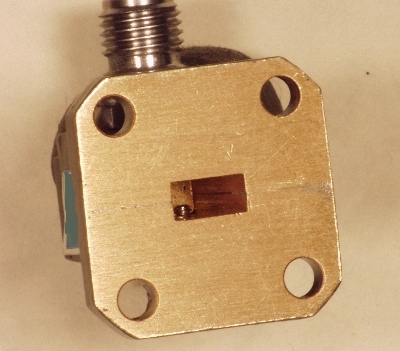 These were built using "split-block" construction, made of brass, with a solder-seam down the middle, which you can clearly see even in this low-res photo. Guess which plane they split the waveguide in? Yes that's right, the wrong one. Now look carefully at the second picture, you will see a void in the solder joint, down inside the guide. This adapter has a major problem, which you would see if you measured its insertion loss (trust us, it stinks!) But what do you want for $260? You gotta wonder what these guys were looking at when they were setting the tuning screws on this piece of work. Here's some pictures of a W-band mixer that was recently for sale, sent in by alert Ebay shopper Thomas. Thanks! Here's a close-up. We're not saying that this part is NOT going to work, if it was carefully brazed it should be OK. But we're saying, if you have a choice, don't do it this way! 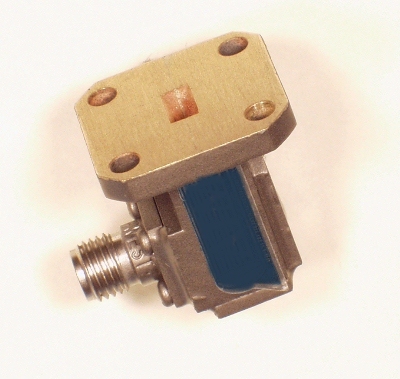 You need to fill the waveguide with a bunch of non-compressable rods (wires). Then when you bend it it doesn't collapse, and you can pull the rods out one at a time until it loosens up. It would also be helpful if you had some type of mandrel jig to bend the guide at fixed radius. Silver, aluminum, brass and copper is pretty bendable as-is, you probably won't need to apply heat. Make the bends out of waveguide stock with some extra length, then cut it to the final length and braze on the flanges.